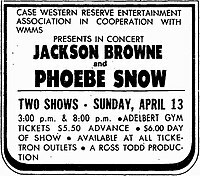 Anuncio para un concierto en 1975 de Jackson Browne y Phoebe Snow. ↑ a b Thursby, Keith (April 27, 2011). "Phoebe Snow dies at 60; singer of 1974 hit 'Poetry Man'. Los Angeles Times. Retrieved April 27, 2011. ↑ Nash, Margo (June 22, 2003). "Still Singing, Still a Fan Of Trains", The New York Times. Retrieved October 10, 2007. "Her first record, Phoebe Snow (Shelter 1974), with the single Poetry Man, went gold, and the 22-year-old, who had been discovered performing in a Greenwich Village coffeehouse, shortly after graduating from Teaneck High School, found herself a sudden success." "Phoebe Snow, powerful singer of 1970s hit ‘Poetry Man,’ dies at 60". The Washington Post.